Signed as a free agent on Feb. 13, 2018. Mrabure was selected in the first round (fifth overall) by the BC Lions in the 2015 CFL draft. He was released by the Lions on June 19, 2016, and signed by the Saskatchewan Roughriders on June 21, 2016. 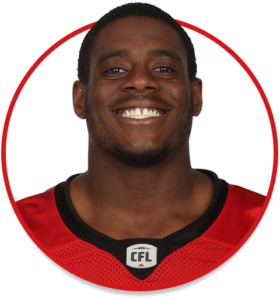 (Calgary) In his first season with the Stamps, Mrabure dressed for 11 regular-season games and recorded four tackles, two sacks and one fumble recovery. His first sack in a Calgary uniform came in a Week 3 game against Ottawa. His fumble recovery occurred in Week 2 in Toronto. (Saskatchewan) Mrabure played 16 games including two starts and recorded 17 tackles, two sacks, nine QB pressures and one fumble recovery. He also dressed for both of the Roughriders’ playoff contests. (Saskatchewan) Mrabure played 16 games and made 14 starts in his first season with Saskatchewan. He recorded 21 defensive tackles, one special-teams tackle and one sack. (BC) Mrabure played six games as a rookie and had one defensive tackle, one special-teams tackle and one sack. The first sack of his CFL career came in a Nov. 7 game against Calgary. Mrabure played 27 games over four seasons (2011-14) at Wilfrid Laurier. He registered 44.5 defensive tackles, three quarterback sacks and one fumble recovery for the Golden Hawks and was named a second-team Ontario University Athletics all-star in 2014. He participated in the 2014 CIS East-West Bowl. His full name is Ese Mrabure-Ajufo. He is an alumnus of Our Lady of Mount Carmel Secondary School in Mississauga, Ont.